It’s not hard to find things to mock, jeer or vilify. But we have enough negativity in the world. We need more people with the awareness and courage required to encourage and empower the people around us. For some people, this can be hard. 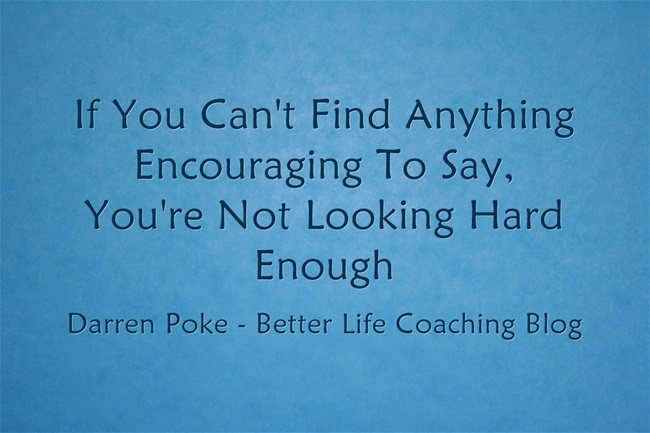 If you’re not in the habit of encouraging others, finding something positive to say can be a challenge. But if you look hard enough, you can find the right words to say to make someone feel better. And some people are difficult to encourage. Their warts are obvious and their capabilities less so. Or perhaps they are in such a negative state that they deflect compliments and deny anything positive that is said about them. But again if you look hard enough, you can find the right words to say to lift their spirits. So let’s start looking for opportunities to encourage others and let’s start making a positive difference in the people around us. Let’s inspire others to greater heights. Let’s help them to see possibilities and potential that they are unable to perceive themselves. Let’s do it today, tomorrow and every day after that. And remember, the more that we encourage others, the easier it is to find things to encourage.